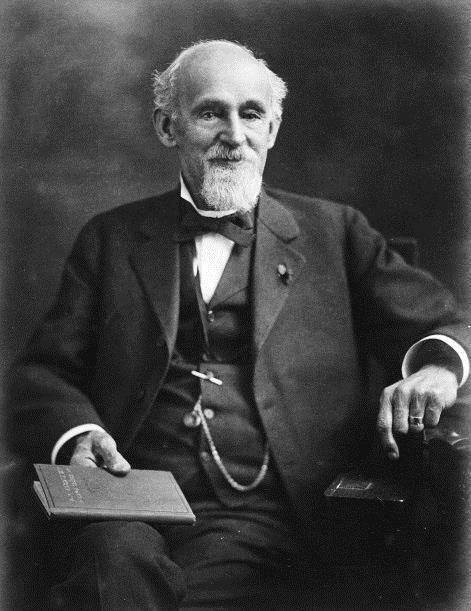 John Brashear (1840-1920) has his first glimpse of the moon at age nine. That influential view of the moon and Saturn stayed with Brashear for the rest of his life. After receiving a common school education until age 15, he apprenticed himself to a machinist and had mastered his trade at age 20. He worked as a millwright in a rolling mill in Pittsburgh, and pursued his love for astronomy at night, including building his own workshop from a three meter square coal shed behind his house, to construct his own refractor. Starting in 1880, he began manufacturing astronomical and scientific optical instruments, and performed various experiments. He developed an improved silvering method that would become the standard for coating first surface mirrors (known as the "Brashear Process") until vacuum metalizing began replacing it in 1932. Brashear patented few instruments and never patented his techniques. He founded the John A. Brashear Company with his son-in-law and partner, James Brown McDowell, and his instruments gained worldwide respect. The modern optical firm currently known as "L-3 Brashear" now bears his name. Optical elements and instruments of precision produced by John Brashear were used in almost every important observatory at the time, and were critical elements in the 1887 Michelson-Morley experiment demonstrating the constant speed of light regardless of direction. In 1898 he became director of the Allegheny Observatory in Pittsburgh, continuing in this post until 1900. From 1901 to 1904, he was acting chancellor of the University of Pittsburgh, after serving as a member of the board of trustees since 1896. Brashear and his wife Phoebe are both interred at Allegheny Observatory, in a crypt with the inscription "We have loved the stars too fondly to be fearful of the night."